So, now I have traffic to look at. Well, it’s only my own traffic but as I’m doing this just as a proof of concept, and to see what information Google Analytics collects, that’s okay. The screen shot below shows the traffic for the one day that Google Analytics has been gathering information. I’ve switched the display to show page titles, rather than the URL for the page, Google collects them both. I could see where either the URL or the page title might give some cause for concern, from an IT Security perspective but I’ll explore these possibilities in a later posting, once I have some more data. Now I get to visit various pages on my SharePoint 2010 My Site to see what turns up in Google Analytics. Okay, guess I didn’t have to wait 24 hours for the updates I made to take effect. Just was on my Google Analytics page and say that the profile for my Intranet site is now ‘Receiving Data’. So I guess the changes I made, described in the previous post; worked. At least enough for Google Analytics to verify my tracking code. Now I just have to give it some traffic to track. Okay, after leaving it for a couple of days my Tracking code was still showing up as not being installed; ‘Tracking Not Installed’ shows up for the specific profile. So I tried copying the URL from the profile in to my browser, to validate I could get to the URL I’d used for the profile, but to my chagrin, okay annoyance, the URL didn’t work. Seems my SharePoint MY Site doesn’t use a Fully Qualified URL, instead it was using ‘http://sharepoint/my’ instead of ‘http://sharepoint.domain.local/my’ as I’d entered for the profile. Now when I use the URL of ‘http://sharepoint.domain.local/my’ the url works. All I have to do now is wait 24 hours or so to see if Google Analytics can now verify that my tracking is installed. Yes I tried updating Google Analytics to just use a URL of ‘http://sharepoint’ but it doesn’t like that. It requires an FQDN, and says as such in the various instructions. You’re going to need to be okay with SharePoint reporting back to Google what pages are being accessed. This could be a security concern, see comments below. Once you’ve downloaded the package copy it over to your SharePoint 2010 server. You’re then going to need to know the path to the package. Open a ‘SharePoint 2010 Management Shell’. When I first tried this using the SharePoint Farm account I got an ‘Access Denied’ error so I re-opened the ‘SharePoint 2010 Management Shell’ by right clicking on it and selecting ‘Run as Administrator’. Just click on ‘Activate’ to activate this new feature for the site collection. Now back at ‘Central Administration’ under ‘Site Administration’ you should see a ‘Google Analytics settings’ entry, as shown below. 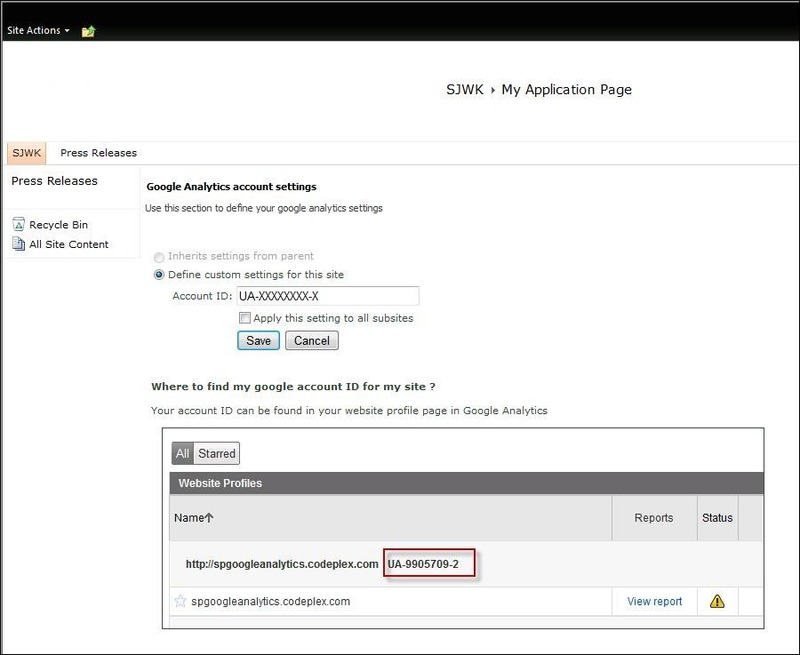 Click on ‘Google Analytics settings’. The resulting dialog is shown below. In the ‘Account Id:’ box enter the Google Analytics code for this particular profile. 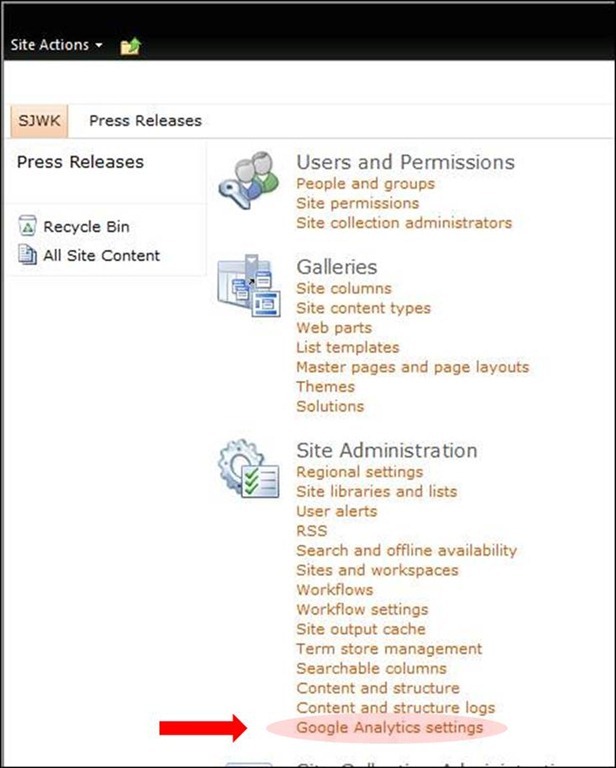 When users access SharePoint pages that usage is going to be reported back to Google so that you can use the Google Analytics to identify what’s going on, who’s looking at what, etc. on your SharePoint site. The $64,000 question is what information is reported back and what, if anything, of that information, might give you or your company cause for concern if others where to be able to view it. is any of this information sensitive. What happens when you access a Document Library and then select a document from that library. Is that document name captured? Is it going to capture host names and or IP addresses? The RSS Feed web part in SharePoint allows you to link to an RSS feed and display that feed in your web part. One of the things that I have found mildly annoying is that the web part has a Title, the default being RSS Feed, and the feed it self has a title, that is displayed as part of the feed. in a number of cases I want to use a different, more descriptive name, for the RSS Feed title. I can do this by changing the Web Part Title. However, the feed name is still displayed, linked back to the source. You can remove the feed name, as it appears within the web part by, using the XSL Editor. Note! this works for most but not all feeds. It’s approximately 30-40 lines down. Delete this text and then click on ‘Save’ then click on ‘Apply’. The web part should now display the feed without the feed name. You can then use the ‘Appearance’ section for the Web Part to put in whatever name you want to use.